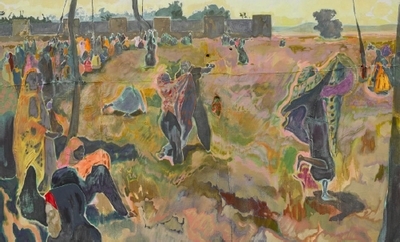 The Chapel is London-based, Kenyan-born artist MICHAEL ARMITAGE’s first major solo show in a public sector gallery in London. A new series of large-scale paintings, made with the chapel-like qualities of the SLG’s main space in mind, explore the ambiguous boundaries between religion, folklore and social consensus, particularly in relation to issues of mental health in East Africa. Drawing on historical and contemporary news stories, socio-political issues and the artist’s own experiences of Kenya, the works blend dream-like figuration with compositional references to Titian, Gauguin and other masters of Western art history. Painted in layers on Ugandan lubugo bark cloth, the texture and ruptures within this distinctive material are integrated into Michael Armitage’s surreal imagery, the seductive colours and surface beauty of which belie the disturbing subject matter upon which it is based. Conjestina, 2017, depicts former world middleweight boxing champion, Conjestina Achieng, as a naked, boxing-gloved figure attended to by animalistic nuns while a pair of copulating baboons carry on regardless in the background. This bizarre and disturbing composition can be read as a critique of the questionable nature of the Kenyan popular media’s documentation of Conjestina’s situation, exposing deeply personal and vulnerable moments of instability but with little clarity as to whether the help offered to her on camera is genuinely for her well-being or merely a crass form of entertainment. This sense of ambiguity characterises another work, Exorcism, 2017, in which Michael Armitage portrays a ritual he observed through online documentation of a ceremony for which women gather to be publically exorcised. In his painterly translation of the event, its true origins are intentionally obscured so that the atmosphere could as easily be read as being celebratory as that of a ritualistic ousting of the devil. The Flaying of Marsyas, 2017, takes its title from Titian’s masterpiece of the same name, as well as borrowing from its composition and dark subject matter whereby Marsyas, a centurion like satyr from Greek mythology, is killed by flaying. Michael Armitage’s equally chilling work portrays a contemporary scene in which a figure tied to a tree is surrounded by a group of spectators. Through these beautiful but deeply unsettling paintings, Armitage attempts to both locate and destabilise his subject matter, harnessing the tensions in his works through tableaux of bewildering social interactions which ask of the viewer what is comfortable, while simultaneously addressing questions of exoticism and ‘otherness’ through their implication of the viewers as voyeurs. Michael Armitage: The Chapel is accompanied by a publication with essays by Mukami Kuria and Roger Malbert, and a conversation between Michael Armitage and SLG director, Margot Heller.